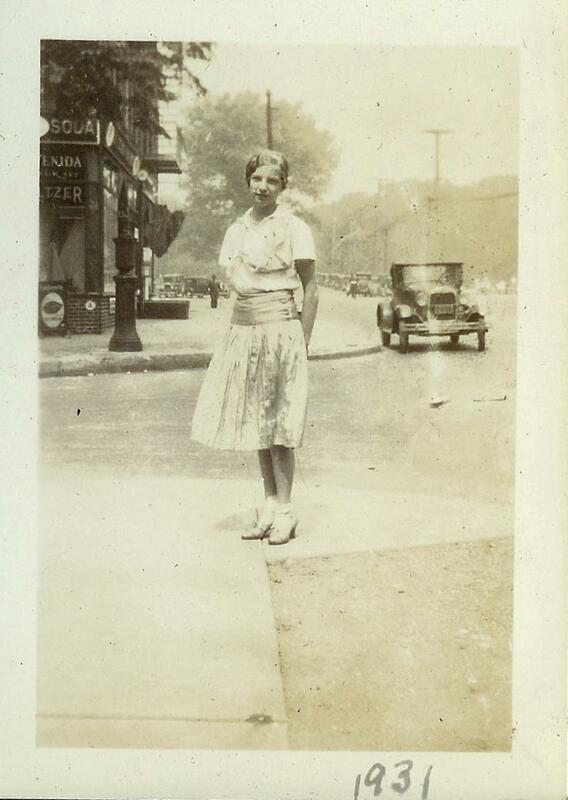 I have been looking at lots and lots of photos lately – mostly of my mother-in-law, Ella Mabel Corke. Her recent death at 99 – almost 100 – prompted a sifting of hundreds of photos. Ella’s family always seemed to have a camera at the ready, so her long, full life is well documented pictorially. I found myself studying two particular photos closely. 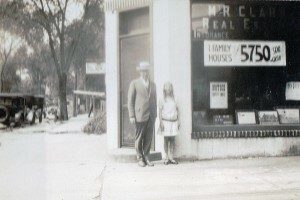 The first, from 1927, shows Ella with her beloved father, Marvin Ray Clark, standing in front of his real estate and insurance business in Richmond Hill (Queens), New York. Twelve-year-old Ella, wearing a drop-waist dress and patterned knee socks, was already taking dance lessons – and it looks like she’s standing in first position. Her 46-year-old widowed father is wearing a suit, boater, and round spectacles. But in addition to their 1920s attire, we see 1920s-era automobiles – perhaps Model T Fords? – parked along the street. I find myself fascinated by the signage in the window, advertising a single-family home for $5,750 with only $500 down. These details make me conjecture: Had Ella had been given the rare treat of going to work with her dad? Was one of the cars their own, and were they going to drive off and visit one of the properties Marvin was selling – or perhaps drop Ella at dance class? In the second photo, from four years later, Ella is standing on a corner, smiling demurely, wearing a dress, anklets, and slightly high heels. Her hair has a wave. We also see part of a store and a long string of cars, with perhaps a Model A in the near background. The ads on the storefront signal a drug store, selling hairnets and seltzer – and, as you can tell from the logo under the window, Breyer’s ice cream. The small white circle to the right of the Breyer’s ad has the Bell Telephone symbol: the store had a public telephone. Perhaps Ella had been to the store to buy a hairnet; as a dancer, she would have needed one for a ballet bun. Or maybe she had used the public phone to call her older brother Ray to pick her up. Or at age 15 or 16, might she have gone for an ice cream soda with a date? If so, was her beau the photographer? When I look at family photos now, I find myself turning more and more to photos like these, rather than to close-ups and portraits. Rich with detail, they draw you much more deeply into the person’s life, and into a particular time and place. It makes me wonder which photos of my own family will yield such detail to viewers of the future. For another approach to this question, read Jean Powers’s post here. Someone said “a picture is worth a thousand words.’ Of course, that is not always true. But for genealogists, studying all of the small details in a photograph can yield very useful information. Comparing the props used in photographer’s studios between several different photographs can sometimes identify the location or the year if only one photograph has had some identification written on the back, or the cardboard case has the photographer’s imprint on it. Another photograph I have shows a house number, enabling me to identify the location and the approximate year based on a census record in 1910. Or, fortunately for me, a never-seen-before, unlabeled photograph of my grandmother and great-grandmother was found in a box of photographs owned a descendant of my grandmother’s great aunt. The photograph was apparently sent from Kansas to the aunt in Oregon in about 1888, and I identified it by comparing other photographs in my collection. Always check out the whole picture. A photo of my husband’s great grandmother has another photo on the buffet behind her….who, what, where? We will never know…..but speculation is a lot of fun. Or Ella is standing on the same corner, facing her father with the camera. The drugstore would then be on the other side of the cross street from the RE office. City directory for Richmond Hill would prove or disprove this. Or, if you have her Dad’s office address, Google it on Street View and see if the lamp post is still there. Download the pic and then do a merge of old onto new for the fun of it; the 2nd one would work better (Not that I know how to do that myself!) The Boston Globe used to run a series in the Sunday magazine of then & now street views, mostly of buildings. My mother saved all the old photos of both her and dad’s families- several generations worth- in a box for me. After my dad’s death, the box went missing, and no one knows (or is owning up to) what happened to it. Naturally, I was heartbroken. Happily, some cousins have been able to provide digital copies of photos in their possession, though mostly studio portraits, individual and family. I treasure them. But I do agree that there is detail and hints to personality in the informal snapshots that made up most of my mother’s collection, including the various houses members of my family lived in over the years. I’ve been able to track down many of the addresses, and have used Google to find some of them in the present (some have changed but some haven’t!). I intend to use those photos and addresses to see if local historical societies may have earlier photos, and maybe even images of their occupants, whether relatives or not (they are still part of the story!). Seems strange that one must explain what the Bell Telephone emblem on a business meant. I worked for Western Electric (the Bell manufacturer) from 1968-1971 and have a tie clip with the Bell symbol on it as well as two other tie clips with types of phones on it plus a bracelet with about 6 different types of phones on it. Speaking of houses, in King Co. WA, where Seattle is and where I grew up, the county assessor’s office has a public website. Entering the current address yields, for most addresses, a photo, and the prices and dates each time the house was sold. Not always the buyers/sellers, but the information is most interesting. With Google Street View to get current view of the house, this can provide quite a history in most cases. I found both the houses I grew up in, the one my grandparents lived in, and those of other family members. My mother’s recollection of what they paid for our two houses, and what they got when they sold them, was remarkably accurate! Pairing all this with snapshots taken in the yards (I’m sorry yours are missing, Annie) adds to the stories. One of my favorites, for instance, was taken in the side yard of our house, me about two, all dressed up and wearing my grandmother’s hat with a veil, with the Carnegie library across the street in the background. That alone tells many stories, as I spent many hours in that library. It also proves the library had big old trees (ca 1946) in what we call the parking strip, which no one when I visited the library about 2010 knew of, adding to their history as well. We just had a family reunion with 1 and 1/2 days of activities. We ended up at our grandparents house now owned by a cousin. In addition to a list of owners of the house he provided 8 1/2 in by 11 in photos laminated and attached by long stakes to the spot each photo was taken. These were the 1940’s dating, graduation and wedding photos of our parents followed by the baby photos of the 1950’s of us cousins. All of us cousins in our 60’s were moved.